Want to turn your living room into a concert? Now you can. Your PS3 has just been upgraded with Qello, the world’s largest collection of full-length HD concerts and music documentaries on demand. And we’re coming to PS4 and PS Vita, too! Qello (pronounced Kwello) has concerts for all music lovers to enjoy any time – from Beyonce and Madonna, to Jay-Z and Tupac, to the The Doors, Eric Clapton, Radiohead, Coldplay, One Direction, Blake Shelton, Queen, a ton of new indie bands, and so much more. Thanks to deals with all the major labels and a host of other content providers, Qello’s catalog spans the spectrum of music genres from the ‘20s to today. And it’s constantly growing! To celebrate Qello’s launch on PS3 – and soon on PS Vita – we’re giving away one PS Vita every week for 4 weeks. Every time you log into Qello on your PS3, you’ll be entered to win a PS Vita! Qello is also giving all PlayStation users a free All-Access Pass (subscription) for the first 15 days after you sign up. 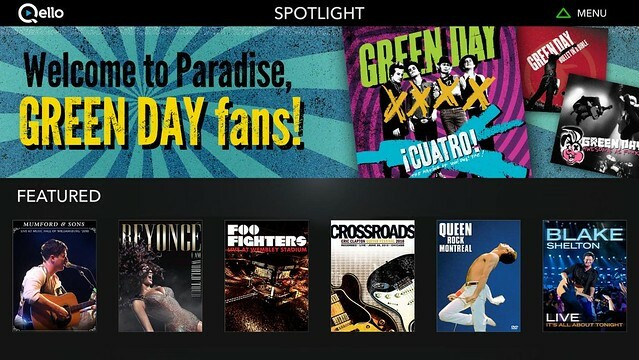 Then, for $4.99/month, subscribers get unlimited access to the entire catalog – every full-length HD concert and music documentary – to watch anytime on any device. You can also purchase an annual subscription with a 25 percent discount. All-Access members also get access to create their own Setlists, a very cool feature that lets you design your dream concerts. 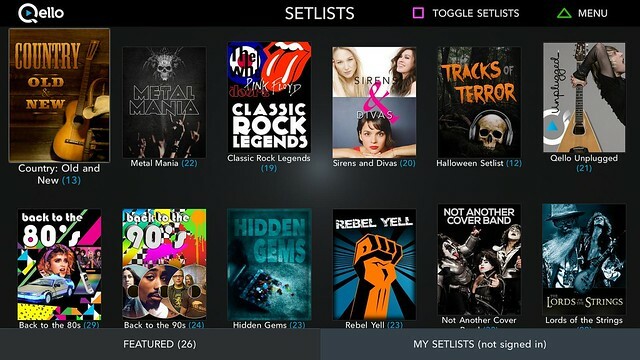 You can find Qello in the “What’s New” and “TV/Video Services” sections on the PS3 XMB, as well as in the “Apps” section of PlayStation Store later on today. The PS Vita version, when available, can be found in the Apps subsection of the PS Vita store. Check back in the coming weeks for an announcement related to the availability of the PS Vita version. Follow Qello on Facebook and Twitter, and check out our blog Inside the Q to learn about all our new releases and other news. I need to give this a look see. If you Canadians want our content, write to your legislators about the bilingual requirements. I’m 99% sure that’s all that’s standing in the way on most of that stuff. Any chance for it coming to ps vita? I’m all for more apps. Even if I can’t use them in Canada. @5 It has nothing to do with billingual requirements. If that was the case we wouldn’t be able to get most video games or digital content that USA gets. It’s usually just media company rights that just won’t allow the content in Canada. Much like how Netflix in Canada doesn’t get half the content that Netflix USA gets. Wish I had access to this but unfortunately I live in outside USA. Does it have drum & bass? I checked their site and it says it is available in 40 countries. So Canada just may be one of them. Awesome application! I have it on my Apple TV and its really a great product, very happy to see its coming to PS4 as well. If you like music and concerts then this is the application to go to, nothing else that I have seen with this massive of a distribution channel does what Qello does. Bilinguist have nothing to do with the long time it takes for Apps to come to Canada. Quebec has their own politics and are quite independant from the rest of Canada, surely isn’t stopping the english apps to come to Canada. But they are reinforcing french in their province (Not Canada as a whole). It’s the CRTC that overviews every new media form to make sure that people don’t hack or have content usually put on cable TV to be found on the internet. IT’s that stupid. It the US, you can start up any company and put it online without any restrictions. CRTC is messed up and gets paid by the big cable companies like Rogers or Bell fiber to keep all of the telecommunication rates high even tough they claim they “try” to reduce it. It’s funny how Canadians can have access to the US version of Netflix without any issues. Doesn’t seem to be available in Canada. There’s a link on today’s blog and if you don’t login to the store, you can get to the Qello page. If you login, it recognizes your Canadian PSN account and says it can’t find the page. Maybe we’ll get this app later. As per the above post, hopefully the CRTC will approve this, but then again, companies in Canada seem to think they can’t compete with these services. This sounds awesome I may have to check this out. Exceptional idea… I got really excited when I seen this… using it now…15 day free trial … but if I were to purchase this (which I did thoroughly consider), the library would have to be expanded dramatically. There were many things that interested me in their library, but not enough to warrant $45 a year. I really hope they expand the library soon with concerts AND documentaries, if this were to happen I’d happily purchase this. This is Nicole from Qello. We are planning to bring Qello Worldwide in 2014, Canada included. + I_SEE_THRU_U thanks for the comment. Our catalog is expanding exponentially! We just signed a deal with Sony Music and Universal, which, with our Warner deal, puts all three major music labels under our one umbrella. We just rolled out the first 8 Sony titles, but we have tons of incredible concerts and documentaries coming in. We also have many other content providers that are always delivering new stuff – from the biggest artists to the new indie bands. Make sure to like our Facebook page, and follow our blog http://www.qello.com/blog to stay on top of all our new releases. Some really exciting stuff coming very soon. And there are so many gems already in the catalog. Thank you for the update and mentioning Canada is coming in 2014.